I made this chicken stock last night. Yum! No, I’m not going to share my stock trading tips with you. I have none. The stock market is way too risky for me. I’m talking about chicken soup stock, of course! There is nothing so delicious on a cold winter’s day than a piping hot bowl of chicken soup—and every yummy pot of soup starts with a quality stock. For those who are unfamiliar with the process of making chicken stock, here’s the basic procedure. Place clean chicken pieces in a stockpot. If you want to make a kosher soup, use kosher chicken. Fill the stockpot with water, reserving 3-4 inches at the top of the pot. Bring water to a boil, then simmer for about a half hour, periodically skimming the foam that rises to the top of the pot. Add some vegetables, herbs, and spices. Some vegetable ideas: carrots, onion, leafy celery, parsnip, zucchini, leek. Some herb/seasoning ideas: fresh parsley, fresh dill, bay leaves, marjoram, whole cloves, thyme. And salt and pepper, of course. I use sea salt or kosher salt and whole black peppercorns (so nobody gets a piece of pepper stuck on their tonsil). Add the salt slowly towards the end of cooking, and taste frequently. There’s nothing worse than an over-salted stock. Once vegetables, herbs, and spices have been added, simmer for two hours or longer. Strain the chicken pieces and veggies out of the broth, and voila. Chicken stock. I’ve made countless pots of chicken soup, and I’ve learned a thing or two along the way about making a rich, flavorful stock. Here are some of my secrets for creating a divine pot of chicken stock. Choose darker meat chicken pieces for your stock base. If you’re not using a whole chicken for your stock, use dark meat pieces like thighs, wings, necks and backs. Dark meat has more fat in it. More fat = more flavor. Don’t be afraid to add giblets! Use fresh herbs and vegetables whenever possible. Fresh ingredients are always the tastiest. Don’t stress about skimming the foam too much. The foam is actually fat pieces from the chicken. Some people skim again after the broth has cooled, taking that filmy layer from the cold broth. Personally, I do a couple of skims at the start of cooking to clarify the broth, but I don’t overdo it. Because again, more fat = more flavor. Create a “stock sack.” I hate throwing away food that has gone bad; it’s such a shame seeing food being wasted because we did not get around to cooking it before it spoiled. Having a stock sack in your freezer can really help you avoid some of that waste. Just place a large Ziploc bag in your freezer. When you have stock-friendly ingredients that you won’t be using anytime soon, freeze them in the stock sack. Want to cook a chicken, but worried about wasting the giblets? Put them in your stock sack. Remember that half onion you cooked with earlier in the week? Stock sack the unused half. Any traditional chicken stock ingredient can go in your stock sack. When you’re ready to make chicken stock, just defrost the sack prior to boiling the contents. Ingredient ideas for your stock sack: any uncooked chicken pieces including wings, backs and giblets; vegetables like carrots, celery, onions, scallions, parsnip, leeks; fresh herbs like parsley, dill, marjoram, bay leaves, etc. Don’t use bouillon. Please. Really. 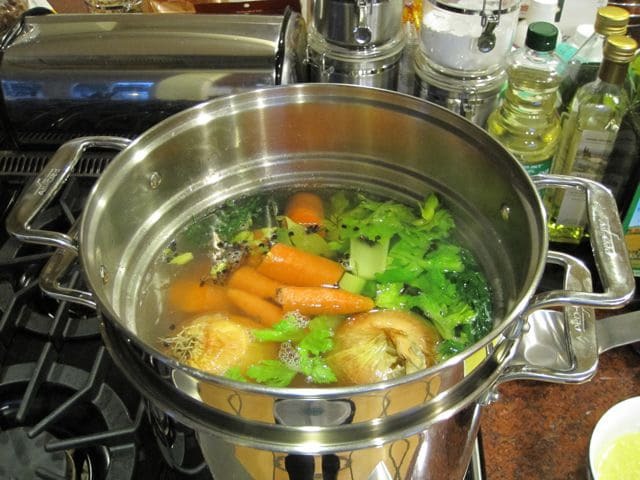 Chicken stock is so easy to make, bouillon is not a shortcut worth taking. Plus, many major brands of bouillon have MSG, which I think has a weird aftertaste. Some recipes call for bouillon, but when it comes to stock, this Shiksa says skip it. What are your favorite ingredients for chicken stock? Do you have your own “stock secrets”? The older the chicken the better. If you can get an old laying fowl so much the better as it will give a more authentic Jewish chicken soup flavour. If there is a yellow bit inside (which would have been an egg, cook that in the stock and reserve it for putting back into the soup to eat. It has a flavour all of its own. If you can get chicken feet, add them too. Save the neck skin and stuff with a stuffing made like matzo balls but with the giblets (which we cooked in the stock) chopped up in it, parsley and any other flavouring, sew skin tightly and cook in the soup. Thank You ! For all the resepies. The all look and taste yam…. I add the juice of 1/2 a lemon to my stock. It adds a nice brightness to the stock without being very lemony. Here is a tip I learned from a chef I used to work with. If you rapid boil your stock, it turns cloudy. For a clear broth, use a nice even simmer. Mmm, now I want to make soup. PS, from my last comment, when doing the matza balls in some other broth, I make sure there is no MSG! Don’t forget to clean the chicken!